Vistabule gives you a different view altogether. Our thoughtful, one-of-a-kind design means you’re oriented to the front of the camper where all the action is. Our huge window means lots of space to take in the sights around you. Claustrophobia is out. Views are in. The sleeping/living area is the size of a queen bed. Big enough for a pajama party, pillow fight, or deep slumbers after a big night of campfire revelry. Unlike other teardrops, your feet don’t have to hide under the backside of the galley. Instead you have a floor to ceiling headboard for stashing all your clothing and gear that includes a pass thru opening that provides a clear line of sight from your car’s rearview mirror to whatever is happening behind you. Our standard trailer is a silver painted aluminum with black accents. Ask us about our new color options! One of the most striking things about Vistabule is the number of windows. The wide-vista front window not only offers a spectacular view of the horizon, it also serves as a dome under which you can lie comfortably and count the stars as you fall asleep. And, Vistabule is designed with safety in mind–the front window is laminated safety glass–the kind you find on your car’s windshield and all of the other windows are polycarbonate or tempered glass. When you want some privacy, you can easily pull down the pleated shade that hides up on top of either side of the window. Vistabule also features wide side windows in the doors and large porthole windows besides. These windows pop open at a touch with screens that keep the bugs out but let the breezes in. Not only can you stow all your camping gear in the kitchenette, there’s plenty of room for pots, pans and food. Above and to the left, is a cabinet for your spices, soaps and paper towels. On the right you have another cabinet for cooking oils, wine, and utensils. Your cooler fits neatly in the center. On the left you have a sink with running water and in the center of the counter is a two-burner stove. Down below, Vistabule has various options for designing the drawers you need to make the kitchenette your own. Vistabule features a convenient pass-through from the cab to the kitchenette, so it’s easy to share dinner when it’s ready. And, of course, like all of our windows, there are sliding screens to keep the bugs out. The Bed That’s Also a Sofa. Typical teardrop trailers are made so that the sleeping compartment has been almost like sleeping in a drawer–feet tucked under the galley in a dark, cave-like, and claustrophobic environment. Vistabule’s design is different. Really different. You can sleep with your head at either end of the camper—no cramped feet here! But not only that, our queen-sized bed converts to a comfortable couch! Great design means with little effort, you can convert Vistabule’s bedroom to a reading room, game room, observation platform, breezeway, game dining room, gazebo, and back porch all in one! A Headboard Built for Your Stuff. The Vistabule headboard has room for every item of clothing you need for your travels. No need to bring a suitcase. The upper storage is ideal for your socks, T-shirts and unmentionables. The handy and simple translucent panels keep things in place on bumpy roads and give you privacy at night. The sliding doors below hide deep storage for your more bulky sweaters, shirts, and pants. 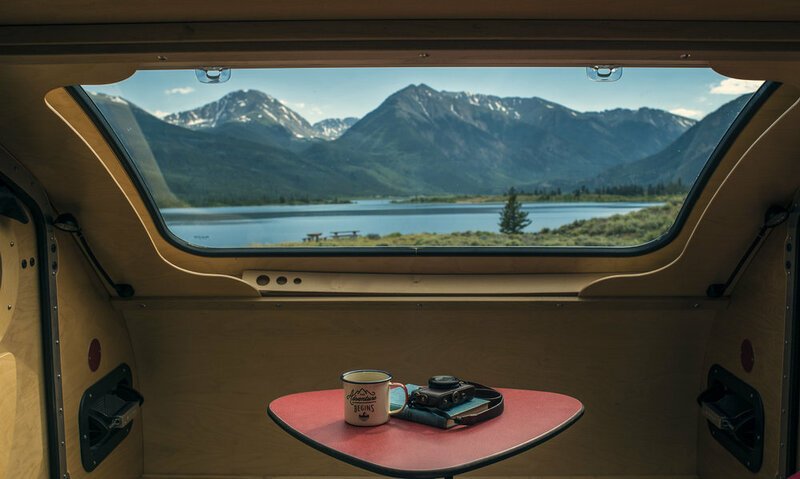 Tables are an important feature in Vistabule teardrop trailers. We offer two double duty tables — a floor mounted one for when the bed is in sofa mode and folding side tables for night mode. When you’re enjoying Vistabule’s living space, a handy little table mounts in the floor before you–perfect for a game of cribbage or a place to set your field glasses while waiting for deer. When it’s bedtime, this table stores easily in its own bin on the floor. After you’ve collapsed the sofa into your bed, the fold-up tables on the doors are ready for a last minute nosh, nightcap or to hold your reading materials. When it’s time to sleep, you can either lift the tables to their privacy mode or drop them flat to the doors.